The biggest names in fashion came out for the annual Met Gala at the Metropolitan Museum of Art last night, this time to celebrate the opening of the exhibit on American couturier Charles James. To celebrate the iconic eveningwear designer's penchant for the elegant and the dramatic, celebrities donned full skirts in rich fabrics, opulent jewels, and timeless silhouettes. There were plenty of hits and an astonishingly large amount of misses as well, but let's focus on the winning outfits of the evening, shall we? 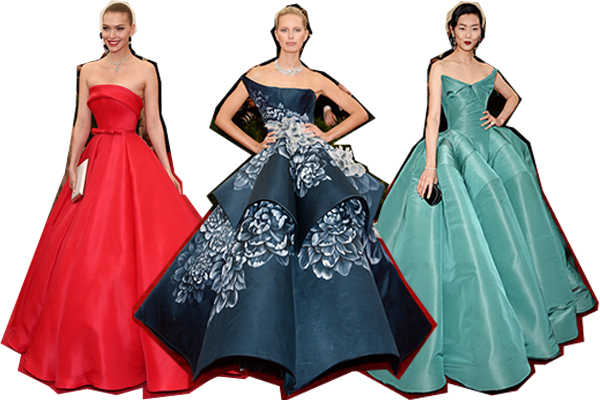 Arizona Muse, Karolina Kurkova, and Liu Wen all rose to the occasion in dramatic full-skirted ballgowns, all looking lovely in their sophisticated ensembles. The three looked every bit the Charles James girl in such classic evening looks, and I'm sure the late designer would have loved to dress these stylish women. Other starlets like Blake Lively, Idina Menzel, and Allison Williams opted for form-fitting gowns with dramatic trains that made a bold statement. All three looked elegant, Old-Hollywood, and goddess-like in their custom gowns. I was especially delighted to see Blake back on the red carpet (with husband Ryan Reynolds looking extremely handsome by her side) after an absence at Hollywood events. Emma Stone and Andrew Garfield were another well-dressed celebrity couple on the red carpet last night. Stone stunned in a pink Thankoon crop top and wrapped maxi skirt, and her perfectly messy braid was one of my favorite beauty looks of the evening. She looked absolutely gorgeous without looking stuffy. And in one of the most unexpected looks of the evening, fashion darling Lupita Nyong'o dazzled in a custom Prada dress that seemed to have hopped out of the most recent Great Gatsby film. You know Lupita had fun with the dress and I think that is why it works so well on her - on most others it would have looked cheesy, but on Lupita it is fun and fresh. Who were your favorite looks of the evening? Are you planning on visiting the Charles James exhibit this summer?